A fake report regarding Gritty's effect at the polls during the November 2018 elections has gathered steam to the point of being presented as true. It sounded too good to be true because it was. I’m talking, of course, about the “news” that Gritty – the Philadelphia Flyers’ revolutionary new mascot – had drawn some 69,000 write-in votes in last week’s gubernatorial election in Pennsylvania. That figure would've landed Gritty in third place, as he'd have bested Libertarian candidate Kenneth Krawchuk and Paul Glover of the Green Party by 21,000 and 42,000 votes, respectively. You may have seen this report either on social media or on Saturday Night Live’s “Weekend Update” just two days ago. The “source” of the information? A tweet from Thursday afternoon, courtesy of the account Philly Snark – bio: “For whom? For what? 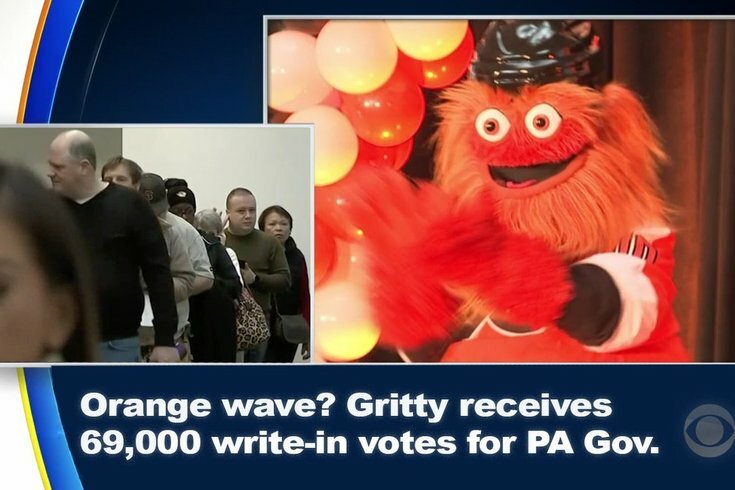 Satire, you rubes” – which reported a potential “orange wave” by way of “election officials” who claimed Gritty drew that nice number of votes. That the photoshopped image included a CBS3 tag probably helped bolster willful suspension of disbelief for many. But not me. Nope. You see, I’m in the midst of compiling the REAL write-in tally for Gritty across eight counties in southeastern Pennsylvania and South Jersey. With three counties already reporting in, Gritty has a grand total of 28 write-ins. Expect that number to increase substantially as I won’t be getting official results from Philadelphia and four outlying counties until later this week. Michael Hanisco is the brains behind Philly Snark, a pet project he hopes to develop further in 2019, albeit with a bit of a conscience. "There are a ton of mean-spirited satire accounts out there and I don't want to be lumped in with them," he said. "There are a lot of serious issues in the city that I'll never make fun of, but there's so much weirdness out there that I don't think exists anywhere else in the world. We need to embrace it and laugh at ourselves when we can." With this tweet, though, he just can’t believe so many people bought into it – hook, line and sinker. For evidence, he presented this tweet from the former chief speechwriter for Attorney General Eric Holder and Joe Sestak. It was the reaction of SNL, which has made a cottage industry out of disrespecting Gritty, that really got him. What’s also nice is the fact that we here at PhillyVoice are committed to ensure you get the proper number of write-in votes for Gritty. We’re still awaiting returns from several counties and will present the tally as soon as we darn well can.